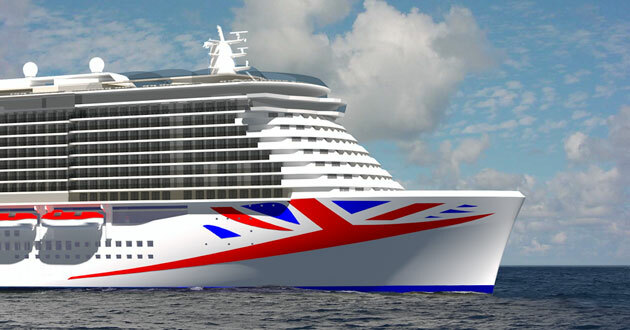 (12:30 p.m. BST) -- P&O Cruises has announced plans to build a 5,200-passenger cruise ship -- the largest ever built specifically for the U.K. market -- for delivery in 2020. The Liquefied Natural Gas (LNG)-powered ship will top 180,000 tons and will be based in Southampton and will be family-friendly. The as-yet-unnamed ship will dwarf P&O Cruises' current flagship -- the 3,647-passenger, 141,000-ton Britannia, launched last year. However, P&O Cruises' senior vice president Paul Ludlow told Cruise Critic that the ship will be "evolution not revolution" in terms of what features to expect onboard. "I can confirm that there will be some stand-out features in terms of design. And given the scale of the ship it does give us the chance to come up with features which will be brand new for the brand." However, Ludlow ruled out any features such as dodgems, climbing walls, simulated skydiving or simulated surfing, as can be found on Royal Caribbean ships. He said: "We are P&O Cruises and we know the tastes of our guests, so we will evolve rather than change." A statement from P&O Cruises read: "Through an innovative use of space, the ship will offer an extensive range of dining, entertainment and relaxing features." Ludlow confirmed more details would be released on October 26, at a press event. The ship has no name yet, but a spokeswoman told Cruise Critic: "We are open to suggestions!" He said the decision to order a huge new build for the U.K. market was down to P&O cruises having "a really strong last two years", as well as a greater proportion of people in the U.K. wanting to cruise. He added: "We believe the U.K. market can grow even further and as well as our current guests there is a large proportion of people yet to cruise." The ship will be built at the German and Finnish shipbuilders Meyer Werft and Meyer Turku. It will feature the shipbuilders' "green cruising" design as one of the first generation of cruise ships to be fully powered by LNG, which will significantly reduce air emissions and will become the most environmentally efficient ship in P&O Cruises' history.